For a perfect finish on your hardwood Pear Stairs, we recommend fitting a cross grained pellet on all drill holes. 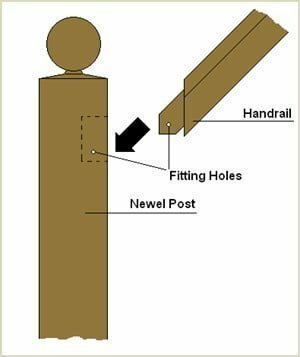 Firstly, fit the handrail to the newel post as shown, making sure that the fitting holes roughly match up when the handrail is fitted. 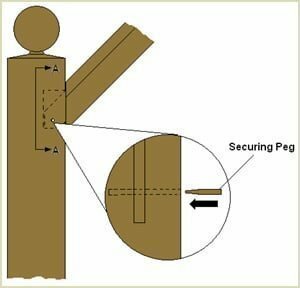 With the handrail sat in place, a securing peg needs to be driven into the fitting holes. The peg needs to be chamfered around the edges at one end. This allows it to be fitted with ease. 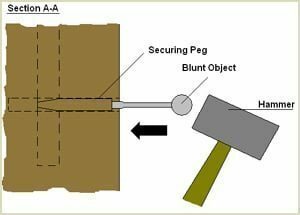 A long blunt object needs to be used in conjunction with the securing peg and gently hammered into place to lock the handrail into the newel post. 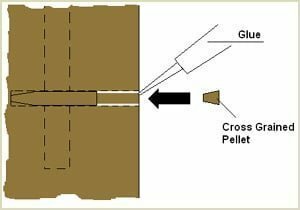 With the securing peg in place, apply some PVA wood glue around the inside edge of the alignment hole and fit the cross grained pellet as shown. 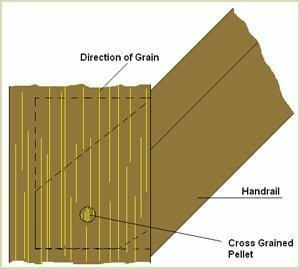 Make sure the grain direction of the pellet matches that of the grain direction of the newel post. 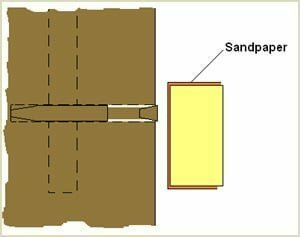 After allowing adequate time for the glue to cure, sand down the protruding edge of the pellet so that it is flush with the edge of the newel post. With the cross-grained pellet in place, the newel post and handrail should look similar to that shown. Note the direction of the grain of the pellet should match the direction of the grain of the newel post giving a convincing finish to the whole process. This should provide the perfect finish to the investment you have made in your Pear Stairs. Pear Stairs advise many people on their staircase finishing, remember if you have any questions don't hesitate to phone us, we are a friendly company, phone Pear Stairs on 01938 553311.